Friends and families have made a tradition out of gathering at Chickasha's annual Festival of Light to enjoy millions of twinkling bulbs, horse-drawn carriage rides, drive-through light displays and old-fashioned hot chocolate and snacks. As snowflakes tumble softly to the ground and Christmas lights shine brightly across the state, Oklahoma offers plenty of ways to enjoy the magic of winter. Browse our list of the top things to do this winter in Oklahoma and experience everything from traditional favorites to modern twists on winter fun. From Thanksgiving to New Years, downtown Tulsa becomes a hub of holiday activity. 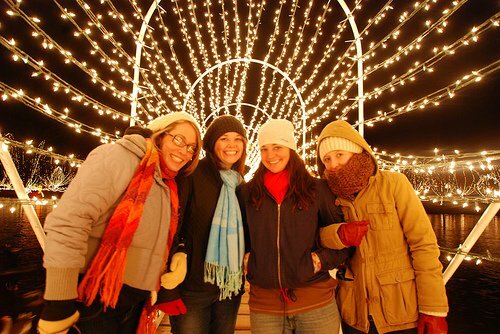 There’s something for everyone at Winterfest including outdoor ice skating, Oklahoma’s tallest outdoor Christmas tree, a Segway Santa and cozy carriage rides. Pick up Made-in-Oklahoma gifts while you’re there or join the Jingle Bell Run & Walk to work off that extra piece of pie. Whether you decide to drive through Chickasha’s Shannon Springs Park to see 3.5 million twinkling lights or stretch your legs to take a walk under the famous Crystal Bridge, the Chickasha Festival of Light does not disappoint. Known as one of the top ten light displays in the country, its centerpiece is a 172-foot lighted Christmas tree. Grab a cup of cocoa while you’re there for an iconic Oklahoma experience. Spread holiday cheer among the Endangered Ark Foundation elephants during the festive Elephant Holiday Encounter. After munching on cookies with Santa & Mrs. Claus, get ready to meet the elephants and hand-feed them Christmas Cake for a sure-to-remember holiday experience. Hit the rink in downtown Tahlequah during the Snowflake Winter Festival Ice Skating event. The holiday lights and festive decorations will seem even brighter while you’re gliding across the ice with family and friends. While there, take in the sights from a horse-drawn carriage, meet Santa and warm up with a cup of hot chocolate. The weather outside may be cold, but the cabins at Keystone State Park are warm and cozy inside. Book your winter stay and light the fireplace in your cabin for a getaway filled with relaxation and beautiful views. Watch the snow fall outside as you curl up by the fire with a good book, a steamy mug of coffee and a soft blanket. History is brought to life at the annual Fort Reno Christmas Guns event in El Reno. A lively take on a German tradition, firearms such as guns and cannons are discharged to ward off unwanted spirits. Located on the grounds of Historic Fort Reno, this event also features storytelling, a chili cook-off and even a visit from Santa for the children. As temperatures dip, there’s no better way to stay warm than with a hot cup of coffee. Sip a mug of Bricktown Coffee at Mickey Mantle’s Steakhouse for a sinful mix of dark cocoa, amaretto and Irish cream. This specialty drink, which is topped with a dollop of whipped cream and a red cherry, gets an extra kick of sweetness from a cinnamon-sugar rimmed mug. After the stress of the holidays, spend a day getting pampered at Le Visage Day Spa in Norman. Unwind with a luxurious peppermint body wrap that will leave you feeling refreshed. Get the VIP treatment and rejuvenate your skin with a moisturizing regiment or take advantage of one of their seasonal services packages. Opening Night is Oklahoma’s biggest New Year’s Eve party. 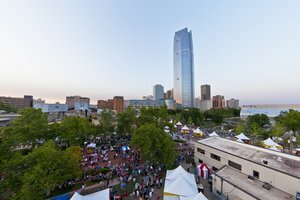 Roam downtown Oklahoma City and have fun taking in live performances, buying party favors, watching fireworks and waiting for the ball to drop with over 70,000 revelers. There is plenty to see at the Tulsa Zoo during the winter months. Watch over a dozen black-footed African penguins waddle their way around a state-of-the-art habitat while visiting the world-class penguin exhibit. Afterwards, make your way through the zoo to gaze upon the adorable snow leopards and their cubs. Take the kids to meet Saint Nick at Crystal Christmas in Woodward. After the little ones have told their wish lists to Kris Kringle, take them on a lighted train or hay ride around the park to view live nativity scenes. Don’t forget to visit the gift shop for popcorn before you venture off to look at the lights. #12 - Take a Swim - Really! If you just can’t wait for summer to begin, the Water-Zoo Indoor Water Park in Clinton will keep you cool until the warmer months. This climate controlled water park is kept at an ideal temperature for swimming all year. Enjoy over 28,000 square feet of activities for all ages including a Cub’s Cove for tiny tots, the Tornado Bowl for the adventurous and even a Lazy & Crazy River for a relaxing dip. Watch a little girl’s dreams come true during a story filled with sugar plum fairies, Christmas imagery and a Nutcracker prince during a ballet performance of “The Nutcracker.” Both the Oklahoma City Ballet and Tulsa Ballet plan to whisk audience members away on a journey filled with timeless musical scores and impeccable choreography this season. Head to one of the state’s many Christmas tree farms to choose from fresh Douglas Firs, Virginia Pines, Colorado Blue Spruces and other varieties during the holidays. Many of the farms also feature petting zoos, model trains, complimentary candy canes, gift shops, apple cider and more. Colder temperatures bring beautiful bald eagles to Oklahoma. For some excellent bird watching, grab your binoculars and warmest coat for the annual Eagle Tour at Sequoyah State Park in Hulbert. The Sequoyah National Wildlife Refuge in Vian also hosts Eagle Tours & Loon Watches throughout the winter months, so head out for some fresh air and watch these beautiful birds soar through clear skies. Find truly special gifts for yourself and others at Oklahoma’s holiday craft shows. Browse through beautiful jewelry, home décor, accessories, art, fresh baked treats and much more. Spend a chilly afternoon shopping inside and discover handmade treasures ranging from ornaments to all natural beauty items not available anywhere else. Winter calls for thick, full-bodied beers and Pete’s Place in Krebs has just the brew. Delicious chocolate and coffee undertones are the trademark of Choc Beer’s Winter Stout. Pick up a six pack of this microbrewery’s seasonal beer while dining on Pete’s famous Italian cuisine. The Garden of Lights in Muskogee is a sight to behold when Honor Heights Park is covered in over 1.2 million twinkling Christmas bulbs for the holiday season. During your walk, you’ll see animated displays of deer, squirrels and birds among illuminated bushes that look as beautiful as they do in spring. Eggnog is an iconic flavor of the season, so get your fix of the rich, decadent specialty in cupcake form at Pinkitzel in Oklahoma City. Sink your teeth into an Eggnog Cream Cupcake and satisfy your craving for something sweet. For traditional eggnog, pick up a carton of Oklahoma-made eggnog from Braum’s all season long. Visit the Sherwin Miller Museum of Jewish Art during Hanukkah for a special holiday display and to learn about the history of the Jewish people. Named as one of the best Jewish museums in the country, the museum features artifacts that span 5,000 years of history and range from archaeological pieces to synagogue textiles and fine art. Plan a special shopping trip to North Pole City to explore 20,000 square feet of Christmas decorations, greenery, lights, hard-to-find collectable ornaments and everything else you need to jump start your holiday. Kids love North Pole City and even have the chance to ride a mini-train. 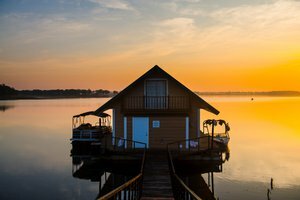 If you love fishing but don’t like the cold, Lake Eufaula State Park’s enclosed, heated fishing docks are the perfect spot to cast a line. Relax and spend the day leisurely baiting your hook and catching fish while enjoying the comfort and warmth of a toasty dock during the year’s coldest months. A cinnamon roll hot out of the oven is the perfect winter breakfast or sweet treat. Get your fill during a meal at the Tower Café & Cinnamon Roll Bakery in Okarche or stop in to Tally’s Café in Tulsa for an amazing cinnamon roll the size of a dinner plate. Step back into the Victorian era by visiting Guthrie’s Territorial Christmas Celebration, which features festive nights throughout December that include carolers in early 20th century costumes, candlelit trolley rides and classically decorated store front windows. Pick up some delicious snacks from roadside vendors, enjoy the sparkling lights or go on a Victorian house tour. Pick up the sweet and slightly spicy treat of handmade pepper jelly at the Amish Cheese House in Chouteau or the Route 66 Nut House in Claremore. With varieties in red and green, it is the perfect complement to any Christmas feast. The Amish Cheese House also specializes in delicious handmade cheese balls, cider, fudge and other goodies that are reminiscent of winter. See Elk City’s Christmas in the Park from a special vantage point and tour Ackley Park’s light displays from the top of an English double-decker bus. Children also love the Centennial Carousel and Candy Cane Train. For an even more relaxing trip through the park, hitch a comfortable ride in a horse-drawn carriage. Winter is the perfect time to fire up a hot tub at Pine Lodge Resort in Ketchum. Let the warm water melt all of your cares away while enjoying a gorgeous view of fresh snowfall from the comfort of a cabin deck. Plan your trip during the Winter Wonderland Christmas Light Tour to see the resort lit by over 400,000 shimmering bulbs. As famous architect Frank Lloyd Wright’s only realized skyscraper, the Price Tower in Bartlesville welcomes the New Year in a unique way. At midnight, witness a huge olive lowered down the side of the building and into a giant martini glass during the annual Olive Drop. Enjoy live music from local artists, hors d’oeuvres, party favors and champagne to toast another year. This Christmas, don’t leave just any milk and cookies for Santa. Buy a dozen of gourmet creations from Barbee Cookies in Tulsa. Their wide variety of flavors ranging from cinnamon roll to double delicious chocolate are sure to satisfy Santa’s sweet tooth. Their special line of Christmas cookies even come shaped like candy canes, ornaments, snowflakes and stockings. 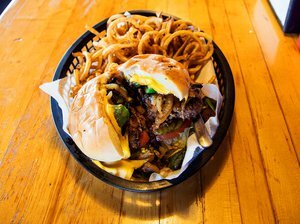 Specializing in classic Southern meals, the Good Gravy Diner serves up omelets, breakfast burritos, chicken fried steak and specialty burgers. The hardest part of ordering is deciding which of the 40 different kinds of gravy you’re going to smother your biscuits in. Held near Valentine's Day each year, the Firehouse Art Center’s Chocolate Festival in Norman has garnered national recognition. This award winning food festival boasts over 25,000 samples of everyone’s favorite sweet treat in various forms ranging from fondue to cream filled cakes. Thirty area vendors put out the best of the best to tempt your taste buds and keep you coming back for more. Start your New Year’s resolution on the right foot and head out to one of Oklahoma’s state parks for a day of hiking. Let the cool air invigorate you and take in the beautiful surroundings while you explore unique terrain. Make a special resolution to hike in all of the parks in the next calendar year for extra motivation. From December to February, Oklahoma City Thunder basketball is in full swing. Head to the Chesapeake Energy Arena to get out of the cold and experience the excitement of NBA basketball in OKC. Whether you’re rooting from Loud City or the sidelines, have a blast Thundering Up with the rest of Oklahoma. The Christmas Express in Oklahoma City is a holiday attraction unlike any other. This Oklahoma Railway Museum train ride brings the Christmas story to life aboard an old-fashioned steam engine. After hearing Christmas stories read aloud while sipping hot cocoa, be sure to enjoy festive Christmas carols, photo opportunities with Santa Claus and Mrs. Claus and goodie bags for the kids. During December, Christmas parades featuring everything from Mr. and Mrs. Claus to the Grinch pop up across the state. Attend a small town celebration with a lot of flare or a big city extravaganza with hundreds of floats to get your dose of holiday happiness. Check out a complete list of Christmas parades here. Since 1952, the Frederick Fantastic Oyster Fry & Craft Show has been an Oklahoma winter tradition. Get your fill of fried oysters that are fresh from the Gulf of Mexico. Their secret recipe batter is paired with homemade coleslaw, potato chips, bread and iced tea for an unforgettable meal. 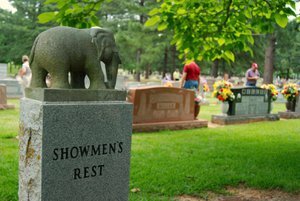 While you’re there, browse through the craft show to find a keepsake. Look fashionable this winter with scarves, cardigans and knit leggings from Sumac Trading Co. in Duncan. Stop in for exciting deals and items you can only find in-store, such as a wide variety of Oklahoma themed t-shirts and other apparel. Oklahoma City’s Asian District buzzes with excitement during the Chinese New Year. Join the festivities and enjoy a steaming bowl of pho at either Pho Lien Hoa or Pho Cuong before heading to the Super Cao Nguyen market for a parade and other activities in the heart of Oklahoma’s vibrant Asian community. This winter, the Tulsa Oilers take over the BOK Center for hard-hitting hockey. Watch them compete against other teams in the East Coast Hockey League during another exciting season. The Living Nativity at Shepherd’s Cross in Claremore gives you the chance to walk through an interactive depiction of the birth of Jesus Christ. Complete with actors in full costume, farm animals and a barn, this one-of-a-kind event is fun for the whole family. During the nativity, Shepherd’s Shop is open and features seasonal treats, homemade items and gifts. Get away from it all and book a room at the Canyon Inn at Medicine Rock Ranch in Lookeba. This bed and breakfast resembles a charming ranch house and is complete with deep claw-foot tubs, fireplaces and comfortable leather furniture. Stay at this secluded, luxury inn and relax during or after the holidays. Deck the halls this holiday season with a real wreath from the Owasso Christmas Tree & Berry Farm. Find the perfect piece to complete your decorations and bring the scents of pine and fir home with you. Adorned with real pinecones, beautiful bows and shiny ornaments, each creation is one-of-a-kind. Oklahoma shops have perfect stocking stuffers for everyone on your Christmas list. Creative types will enjoy zany gifts from Cloverleaf Boutique in Ardmore. Foodies will enjoy treats from Sovereign Fine Gifts & Bedre Chocolates in Ada and tasty cheeses from Gourmet Gallery in Edmond. Complete your sports fan’s wardrobe with an OU t-shirt from Blush in Norman or OSU loot from For Pete’s Sake in Stillwater. Travel to Oklahoma’s original capital city of Guthrie and enjoy the Pollard Theatre’s annual production of “A Territorial Christmas Carol,” a take on the Charles Dickens classic that has been adapted for the stage and set during the Oklahoma Land Run. This play is very popular each year, so reserve your seats sooner rather than later. Stay active this winter after indulging in sweet treats and savory meals by signing up for a winter 5K. Run through downtown Oklahoma City and race to the finish line during the SandRidge Santa Run, or bundle up for the Run the Lights 5K & Fun Run held in Bartlesville's Johnstone Park. This 5K takes place the day after Thanksgiving, and the path winds through holiday lights to get you in the spirit of the season. During Downtown in December, the Bricktown Entertainment District turns into a wintery play place. Take a water taxi ride along the Bricktown Canal to see Oklahoma City adorned in Christmas lights and festive cheer. Also, don’t miss your chance to see some of the city’s best museums for free during Free Museum Sundays in December. Surprise your special someone for Valentine’s Day and whisk them away on an impressive date. Enjoy dinner by candlelight and sip on a fantastic glass of wine at one of the Oklahoma’s most romantic restaurants. Whether your sweetie likes succulent seafood, juicy steak, contemporary American cuisine or a heaping plate of Italian fare, there’s a restaurant with just the right ambiance to let sparks fly. 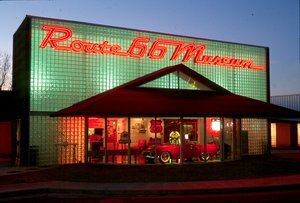 Winter is the perfect time to explore Oklahoma’s small towns for some great antiquing. Copper Penny Trading Company & Backroom Café in Cushing is full of handcrafted antiques and one-of-a-kind vintage creations. Head down the street to Old Songs Sung Here for more antiquing and don’t miss out on great finds in the Downtown Antique District in Perry. Warm up from the inside out with a cup of hot chocolate from Cappuccino Corner in Claremore. This creamy, rich drink will satisfy your sweet tooth and combat the winter cold. While you’re there, grab breakfast or lunch. Choose a delicious meal from their selection of breakfast burritos, sandwiches, salads and more. Oklahoma City Ballet presents: "The Nutcracker"